kimjongnumbaun wrote: Agreed ricnunes. If Canada wanted to purchase anything other than the F-35, they would have done it by now. Instead they are holding an open competition, which includes the F-35. And we all know what the competition will say. Yes, I agree with you as well and I also think that if Canada wanted to purchase anything other than the F-35 they would have done it by now. Actually there was an attempt in doing something like this (purchasing an aircraft other than the F-35) with the plan to purchase "interim" Super Hornets but we all know how that ended, don't we? "...Both a northern approach to the United States, as well as a critical location for projecting American power, [ALASKA] geo-strategic significance is difficult to overstate. Key defense assets dot the landscape. The Air Force operates most of our Arctic locations — from fighter and tanker bases to space-tracking systems and radar sites that detect aircraft and missiles coming over the poles. One way to view the region’s growing importance: By 2022, Alaska will be home to more advanced fighter jets than any place on Earth. At the end of the Cold War, many considered the Arctic to be a secure border, whose frigid expanse acted as an extra layer of homeland defense. Today, technological advancements by potential adversaries are making this once forbidding border increasingly porous. Bright side is they will be full Block 4 models and quite future proof as they like to keep their jets loooong . marsavian wrote: Bright side is they will be full Block 4 models and quite future proof as they like to keep their jets loooong . Exactly. New CPUs. Advanced EOTS. Upgraded DAS. etc. Or resuming, Canada only needs to buy the SDBIIs (if it chooses the F-35). That's if the F-35 even gets to compete. Given that this whole mess started over the need to "stick to the letter of the law", I don't see a legal justification for keeping the F-35 out of the competition. The one thing that they can do is to set a requirement that it cannot meet like "must have two engines". SpudmanWP wrote: Given that this whole mess started over the need to "stick to the letter of the law", I don't see a legal justification for keeping the F-35 out of the competition. The Gripen Fanboys will not be pleased. hb_pencil wrote: That's if the F-35 even gets to compete. 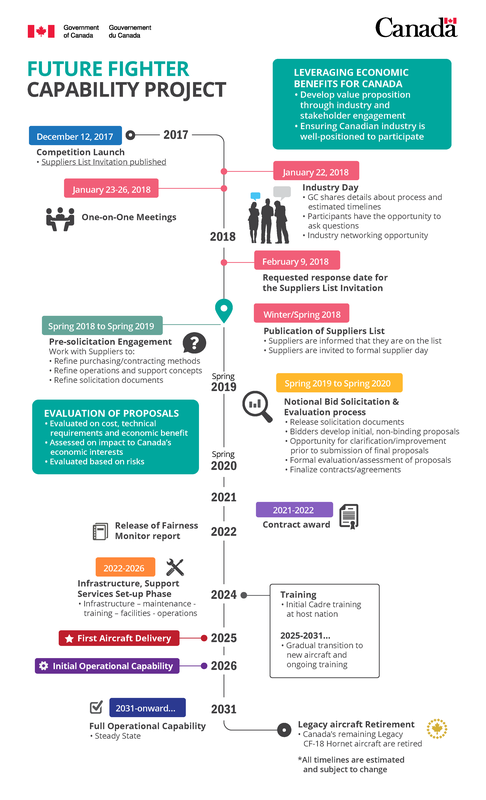 "We will immediately launch an open and transparent competition to replace the CF-18 fighter aircraft"
"F-35 contracts are valued at US$490 million for the period 2002 to 2012, with an expected value of US$1.1 billion from current contracts in the period between 2013 and 2023, and a total potential estimated value of Canada's involvement in the JSF project from US$4.8 billion to US$6.8 billion. No actually they can't do the engine one: the CITT would throw out the competition in minutes if they did. But sticking to the letter of their law is how it will happen... it was outlined in an article spaz posted on here several weeks ago. Just you wait. This government is really that inept. hb_pencil wrote: No actually they can't do the engine one: the CITT would throw out the competition in minutes if they did. For what's worth, the competitors are the F-35, Super Hornet, Typhoon and Gripen E.
So I cannot see how the F-35 won't get to compete. - The only two real contenders/competitors are the F-35 and the Super Hornet. We all know where Boeing and its Super Hornet is with the Canadian competition (with the Bombardier issue and all - which will only get worse with the planned Boeing/Embraer partnership) so that leaves the F-35 as the only potential winner, this IMO of course. Actually a recent tweet by (idiot) PM Justin Trudeau praising Lockheed Martin (and how it creates jobs in Canada) and also the fact that a consortium lead by Lockheed Martin won the Canadian future frigate competition seems (IMO) to point out that Lockheed Martin (and its F-35) are likely the favorite contender regarding the Canadian fighter competition. Oh, has the RFP been released and everybody made their submissions? No. so there are no "competitors." Just interested parties. ricnunes wrote: So I cannot see how the F-35 won't get to compete. Then you don't have a understanding of the basic issues involved in this process. Not a relevant consideration to this procurement.